Irwin's disc paintings of 1966-69 erase the distinction between painting and sculpture. The subtly sprayed, convex discs are lit with low-intensity spotlights, which dematerialize their edges. Free-floating apparitions without visible support, the discs fuse with their background and the surrounding ambience. These works invite viewers to contemplate an indefinite, glowing composite of light and shadow that suggests pure energy rather than form or image. 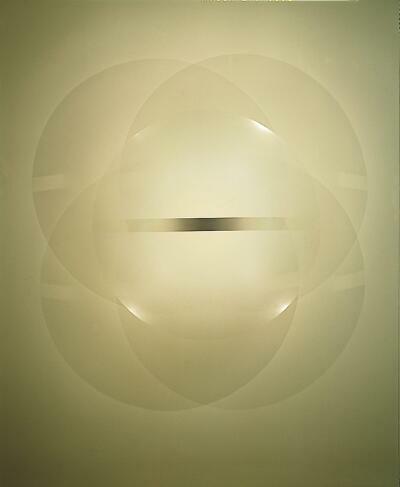 This is one of several “disc paintings” that Robert Irwin did in the late 1960s. It’s not really a painting at all, but it’s also not exactly a sculpture. Irwin created a convex acrylic disc that could be attached to a wall without the method of attachment being visible to the viewer. The disc appears to hover in space, an effect heightened by the overlapping shadows. These are created by two low-intensity spotlights shining on the disc. The exact placement of these lights for proper effect is specified by the artist. The lights erase the edges of the acrylic, dissolving the disc in light even as it protrudes from the wall. These disc paintings blur the distinction between painting and sculpture, projecting a feeling of infinite space and light. At the time, Irwin was interested in Minimalism, a style characterized by hard-edged, geometric forms, complete lack of narrative content, and a finish that shows no trace of the artist’s hand. Over the course of his career, he has explored human perception in many large-scale installations that have become synonymous with the exploration of light and space that has preoccupied Southern California artists since the 1960s.